Asst. Superintendent Public Instruction, 1868-70; a founder Livingstone College, 1885; Bishop A.M.E. Zion Church; founded St. Peters, 1864. One blk. N.
James Walker Hood was born in Pennsylvania in 1831 to free parents who instilled in their son a love of the church and a spirit guided by the need to help fellow African Americans improve their lives through education and religion. Hood’s father was a minister and his work moved the family around the country as he served various churches. Young Hood learned to manage both a life in the church and work as a wage earner during his early years. After he came of age, Hood continued to travel and work in various occupations while nurturing his need to serve in the church. He was licensed to preach in 1856 by the African Methodist Episcopal Zion Church in New York and then moved to Connecticut and Nova Scotia over the next few years preaching and working as a missionary. 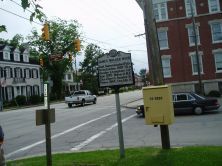 Hood’s most important assignment within the church came about in 1863 when he was sent to North Carolina as a missionary. He served black congregations in New Bern and Beaufort at the end of the Civil War and was successful in establishing a North Carolina Conference of the AME Zion Church in 1864. One of the many churches he helped to form was St. Peter’s in New Bern. He became a church bishop in 1872 and moved to Fayetteville, which would be his home the rest of his life. 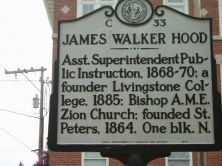 As part of his role in the church, Hood helped to establish Zion Wesley Institute, now Livingstone College as a school to train black students for the ministry and to become good citizens of their state as teachers and artisans. He presided over the school’s board of trustees for over thirty years. In addition to his role in the church, Hood also sought to become involved in politics as a vocal and successful advocate for the rights of blacks. In 1865 he presided over the statewide freedmen’s convention and later participated in the 1868 state constitutional convention and the national Republican convention of 1872. He also held several government positions as assistant state superintendent of public instruction, magistrate, and assistant superintendent of the North Carolina Freedmen’s Bureau. Hood left a legacy of church building, a college, books on church history, and published sermons plus several children who continued his work when he died in 1918 in his adopted hometown of Fayetteville. William Powell, ed., Dictionary of North Carolina Biography, III, 195-196—sketch by John L. Bell Jr.